The love story of Diane and Kenneth. This is the love story about Diane Chayer and Kenneth Jahn Lavrsen. It all started with a very special person with a very special talent. I am talking about the best singer in the world: Céline Dion. I became a fan of Céline in 1994. Late 1995 I joined the Internet. During 1996 I started collecting Céline's records and CDs, and I took part in the discussions in the Usenet news group alt.music.celine-dion. Diane Chayer was also a big fan of Céline and she also took part in the discussions in the news group. We noticed each others postings but never emailed together. In December 1996 I wrote in the news group that I was going to Montréal to see the 3 Céline Dion concerts there. Diane saw this. A common friend and Céline Dion fan David Tsang emailed to Diane and asked if she could help me buying Céline Dion items in Montréal. So Diane wrote to me and offered to take me to her favorite CD store. She also offered to pick me up in the airport. We exchanged a few emails and arranged to meet in the airport. A few days later I started chatting in the Internet Relay Chat group (IRC) #celine on the DALnet. Here I met Diane on chat where she is known as Sittelle. The big day arrived: December the 15 1996. Diane met me in Montréal/Mirabel airport holding a Céline CD in her hand so that I would recognize her. I still remember her sweet smile. We drove to the hotel where I checked in. Later that night we had dinner at a restaurant and Diane took me to a couple of record stores to help me finding new items for my collection. Even though Diane and I had never talked before, it was like we had known each other for years. We said "good night" and we were both happy that we had found a new friend. The next morning Diane gave me a ride from my hotel to the bus terminal in Montréal. I was going to visit my friend Sylvain Beauregard in Quebec City. I remember that I thought about Diane on the long bus ride to and from Quebec City. Diane wrote an email to Sylvain describing me as "sweet as Danish apple pastry". I told Sylvain that Diane was a "very very sweet girl". We met again Tuesday the 17th a couple of hours before the first Céline concert. We had dinner in a restaurant and talked very well together. We then saw the Céline concert. Since we had not bought the tickets together, we did not sit together. I remember that I thought about Diane that night at the hotel before I went to sleep, looking forward to repeat the same thing next day. Dinner and concert. Wednesday we had a very nice dinner again. We both felt that we had fallen in love with each other, but it all seemed so impossible because of the distance between Canada and Denmark, so we did not say anything to each other about how we felt. We continued talking very well during the warm up act at the concert. Again we did not sit together, but we had the chance to dance a little together during "Love Can Move Mountains". After the concert Diane's friend offered to take Diane and me backstage. Diane knew it could take hours and that there were no guarantees, so she said "no" because she had to get up early the next morning. I said "no" too. I chose to follow Diane to her car. I was very much in love and I thought this would be the last chance I had to talk to her. At the car park, we talked a little and Diane invited me for dinner Saturday. Naturally I accepted. Diane knew that I was going to meet two dear friends and Céline fans Thursday and Friday in connection with the last of the 3 Céline concerts. I called Diane at her work Thursday and Diane told me that her friend actually had met Céline backstage Wednesday night, so I had actually chosen to be with Diane instead of Céline. I had a wonderful time together with my two dear friends Allison and Ken (both Céline fans from USA). Saturday evening Diane picked me up at the hotel. We had a very nice dinner and we looked at Diane's Céline pictures and videos. And no force in this world and no distance could prevent what happened that night. When Diane drove me to the airport we had lost our hearts to each other, and we knew that we would meet again. The weeks after we kept in touch by email and by IRC. And naturally we called on the phone now and then. On average we spent 3 hours every day to talk to each other. 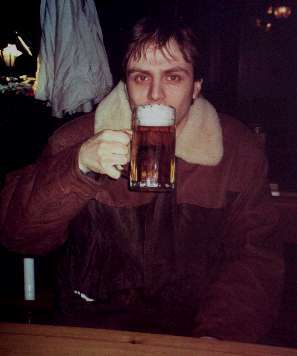 I quickly arranged a new visit to Montréal 2nd week of February 1997. We had a wonderful week together, and at the end it was clear in our minds that we wanted to stay together for the rest of our lives. I met Diane's family who were extremely sweet and warm to me. Diane and I spent our first Valentines day together. We upgraded both our computers to faster types with a sound card, so that we could start voice chatting over the Internet. When I returned to Denmark we continued our 3 hours a day, now mainly voice chatting on the Internet. It meant a lot to us to be able to hear each others voices and talk more freely than you can with text chat. These weeks we spent a lot of time finding out about immigration rules and job opportunities for both of us in each others countries. It became clear to us that we would probably have to get married in a near future. In Easter Diane came to Denmark for one week. 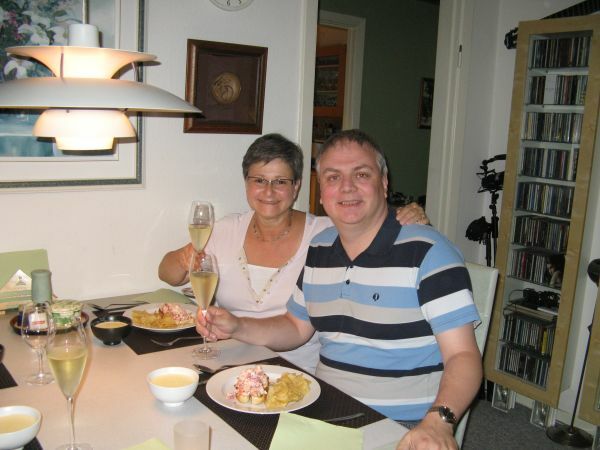 Again we had a wonderful week, and Diane got a very positive impression of Denmark, my family and my friends. Just like I had a good impression of Québec. Three days after Diane returned to Montréal I made a decision. I knew that I wanted to spend the rest of my life with Diane. And I knew that she felt the same. So it was quite natural for me to take the step I took. I spent all of Saturday April the 5th creating a special secret web page for Diane. Part of this web page was the picture below. 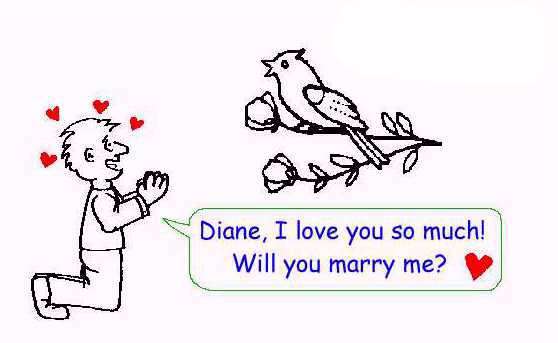 This is how I asked Diane to marry me. And as you all know her answer was "yes". Before the wedding I went to Tivoli in Copenhagen with 3 of my best friends on a little mini polterabend. My friend Lars Jacobsen took the pictures so he is not on the pictures. Lars is participating in a competition of having the most boring home page on the Internet. Here I am drinking one of my last beers in "freedom"
Here are Lis Annette Philipsz and Kenneth Raun. I have heard that they can actually be quite normal. I have known these people since I was 7 years old. They are both in love with Diane's cooking. Especially her lamb and her cheesecake. 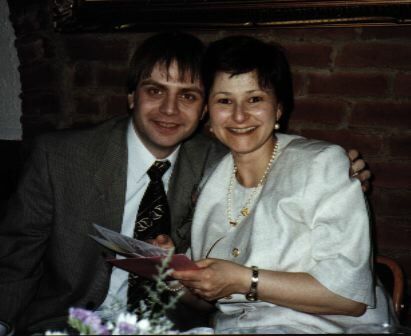 When I proposed to Diane, I had already ordered and paid the plane tickets for my next trip to Montréal in the beginning of May and the tickets could not be changed. 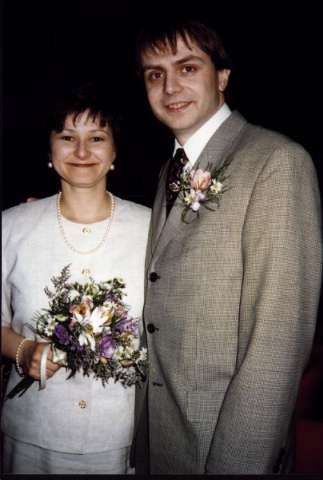 I knew that Diane would love to have the wedding in Canada with her family, so Diane and her mother became very busy arranging a wedding with one months notice. But they did and they did it well. It was a beautiful and wonderful day that neither Diane nor I shall ever forget. It was truly the happiest day in our lives. I am so happy about my new family. They were all very warm to me. The wedding took place May 3rd, in St. Jérôme, Quebec, Canada. 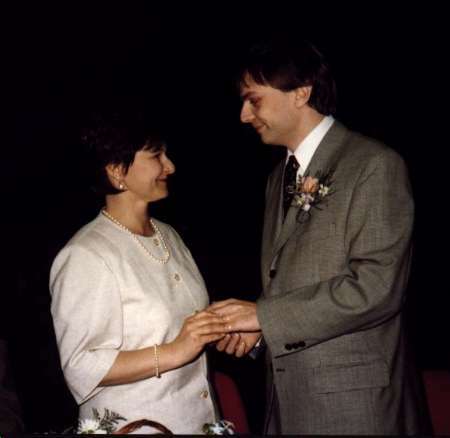 I had one family member - my fathers sister Jenni from Vancouver - present at the wedding, and my best man was my dear friend Marc-Philippe Paquet from Chicoutimi. 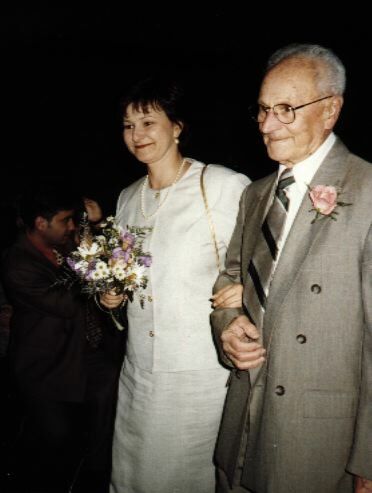 I was very happy that they would both travel far to be with me on this special day. Naturally Diane had all her family and her friends present at the wedding, and we had a great time. One funny detail! I arrived in Montréal Friday at 18:15 and the wedding was Saturday 14:30. Unfortunately my luggage had other plans, so I was standing in Montréal with only the clothes I was wearing. Fortunately I had the ring in my hand luggage. So Diane and I had to shop for a new suit, shirt, tie and shoes 3 hours before the wedding. But it went well, and as you can see on the pictures I looked pretty good. But nothing can compare with how beautiful Diane was. Diane's father leading his beautiful daughter. Doesn't he look proud? 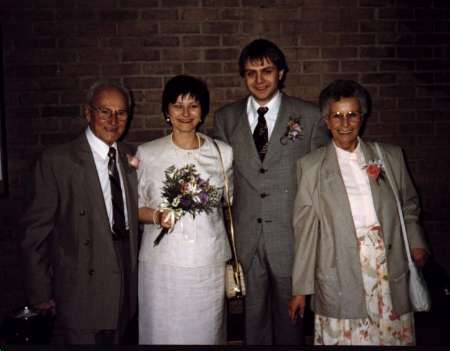 Diane and me with her father and mother. The wedding cake at the wedding party. Here we have just received a present. A weekend at a hotel. Don't we look happy? Same picture as the first, but in large scale. I think we make up a very beautiful couple. Diane made a short visit in Denmark in June 97. Mainly because my career is going very well at the moment, we decided to try our luck in Denmark. 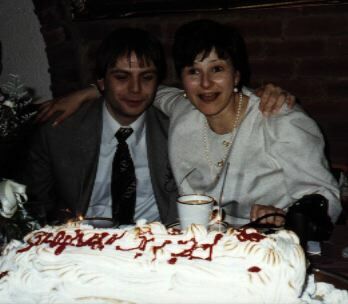 If Diane does not feel happy or miss her family and country too much, I have promised to follow her back to Montreal or maybe a third place on earth. Only time can tell. Diane moved to Denmark August 1st 1997. 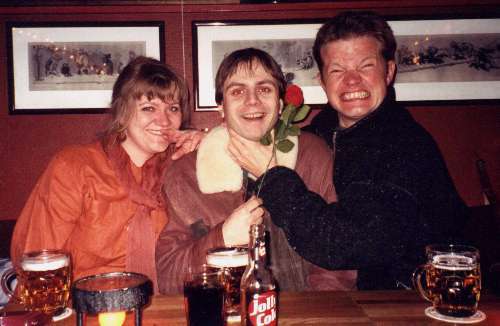 From August 97 to September 98 Diane worked hard for a Canadian company part time and at the same time she spent at least 25 hours a week learning Danish. 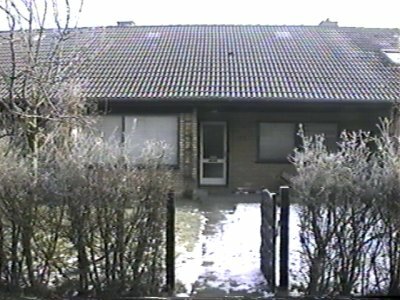 We now live in a nice little house where we have lived since January 99. Diane and I are very happy together.